At the intersection of pastor, geek, and family. 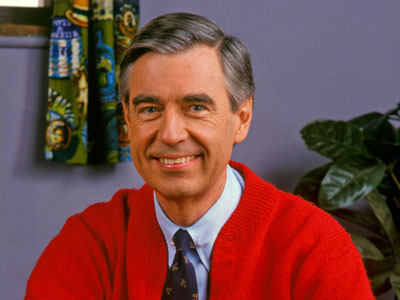 “Dear Mister Rogers, Please say when you are feeding your fish, because I worry about them. I can’t see if you are feeding them, so please say you are feeding them out loud. Children who are blind probably did not make up a large number of Mr. Rogers’ viewers, but he changed a small part of his show just for them, just for Katie. doesn’t know what a “narthex” is or where to find it. has never heard of “Children’s Church” and got a little nervous when after the children’s sermon all the kids (including her son) went with an unknown adult to a mystery location. We don’t do these things to purposely exclude people, but at times that’s what happens. I pray that we can learn from Mr. Rogers who was willing to learn from Katie. This entry was posted in Uncategorized by shawncoons. Bookmark the permalink.